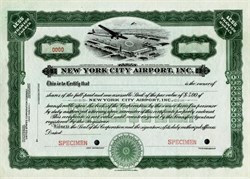 Beautifully engraved certificate from the New York City Airport, Inc. printed in 1929. This historic document was printed by the E. A. Wright Banknote Company and has an ornate border around it with an image of an an airfield. This item has is over 83 years old. New York City Airport, Inc., developing a 300-acre field between Flushing and College Point in Flushing, Long Island, New York. Flushing Airport is a decommissioned airfield in northern Queens in New York City. It is located in the neighborhood of College Point, near Flushing. The airfield was in operation from 1927 to 1984. It was originally called Speed's Airport and was one of the busiest airports in New York City before the emergence of the larger LaGuardia Airport. In the early 1970s a skywriting company operated there. In 1977, a Piper Twin Comanche crashed shortly after taking off, killing those on board. The incident, along with frequent flooding, led to the closing of this airport in 1984. Currently the airport has largely reverted to wetland. Since the outbreak of West Nile virus in New York in the late 1990s, the land has received frequent mosquito larvicide spraying. Though considered trespassing, dirt biking trails still see activity and the frozen swamps become an impromptu ice hockey surface by locals in the winter. As of 2000, Flushing Airport still had its air corridor reserved under FAA regulations. A company called Airships Unlimited has been lobbying to convert the abandoned airport into a "blimp port," citing the fact that Goodyear blimps used this airport in the 1960s. The benefit of this plan would be to preserve the air corridor for Flushing Airport. In 2004, the Bloomberg administration proposed rezoning the area for commercial development as part of the already existing College Point Corporate Park. However, the plan has met significant protests from the local residents who fear such zoning would bring too much traffic to the area. The proposal has since been deferred. As of September 2008, the access road is under reconstruction, to be reopened eventually as a regular public through-street. The north hangar was demolished on September 24. The remaining hangars were also demolished as of October 1. Promoter Alleged to Have Failed to Turn Over 1,000 Shares. William Paul Buchler, promoter of the Now York City Airport, Inc., stock, was arraigned today before Justice Morrla Koenlg in General Sessions Court this afternoon on an Indictment charting grand larceny. He pleaded not guilty and was continued In ball of ft.SOO for trial In September. Before being arraigned, Mr. Buckler was taken to Police Headquarters and fingerprinted and photographed. The trial of William Paul Buchler, promoter of the 14,800,000 stock issue of the New York City Airport, Inc.. will not take place until the Fall, it was Indicated today. An indictment charging him with grand larceny was handed up yesterday. This true bill was voted last Monday, as told in the Daily Star of that date, but was not formally presented in General Sessions, Manhattan, until yesterday afternoon. Mr. Buchler U alleged to have failed to turn over the 1,000 shares of airport stock purchased by Dr. Andrew MacFarland of 142 Fort Washington avenue, Albany. Dr. MacFarland gave the promoter cash and stock in part-payment of the stock, which was valued at $5,000, the true bill states. Later, it is charged, when Dr. MacFarland tendered $2,750 in full payment Mr. Buchler was unable to deliver the stock. The Grand Jury failed to take action on another complaint lodged against the promoter which charged him with having deposited to his own account some $1,900 that he collected from stock sales in the Flying Service of the New York City Airport, Inc., a concern which he is said to have organized. Laurence Halleran, president of the airport; J. Cyril Donoghne, secretary; Mlas Anna Wallace, an employe of the promoter, and several purchasers of the Flying Service stock were questioned before the Grand Jury on the charge against Mr. Buchler that was dismissed. Mr, Buchler was arrested on June 2� while testifying at the opes hearings into the stock-selling!�activities of the airport, of *fW*fVJrt�rr>$. President Harvey,' Ihd JoW- it:- Kapelye, Flushing postmaster, are directors. Assistant Attorney Generals Paul J. McCauley. Lazarus Josephs/fend Jacob Gruber expect to a p p i y i o r a Supreme Court Injunction restraining the founders of the Flushing airport concern from further stock selling activities of any nature. Those to be named in this action, according to Mr. Gruber, are: Laurence Halleran, Commissioner of Public Works John J. Halleran, Edward Stapleton, Mr. Buchler and Mr. Donoghue. Dr. MacFarland made his complaint to Mr. McCauley and the latter referred him to the Manhattan District Attorney. The investigating body voted to indict on Monday, but decided to hear the other charge before announcing its findings.